ST PETERSBURG: It is a birthday Lionel Messi might not like to celebrate. Since the world knows every detail of his life, it is difficult to ignore the day the legend completed 31 years of his life, far away from Rosario where he was born and got married. It’s also quite a distance from Barcelona, where Messi has lived since he was 11, and where he learnt how to mesmerize the world with a ball at his feet. Just outside the entrance of Argentina’s base camp in Bronnitsy, posters announce that the city will celebrate Messi’s birthday. 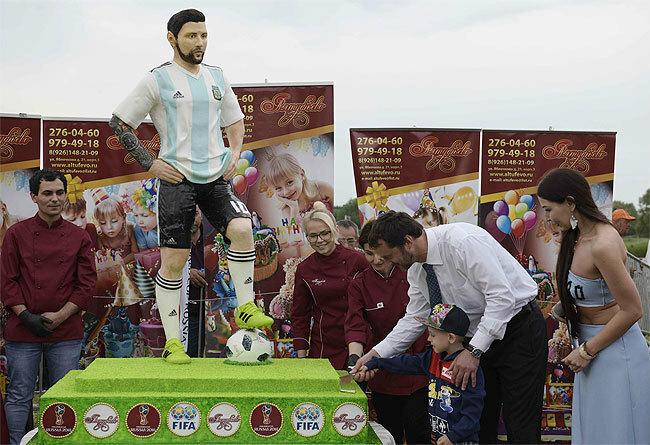 A Moscow confectioner has even created a life-sized cake for the Argentinian star. Not having spoken to the press since the devastating loss against Croatia, the greatest footballer of this generation is fighting demons within – of leading the Albieceleste, now in his fourth World Cup, carrying the burden of expectations of the 43 million Argentinians and having failed them. After the results against Iceland and Croatia in particular, the South American nation has been engulfed by dark clouds of despair. The flock of journalists who made the 13,500 km journey to Russia, are finding it hard to keep their smiles on. It is because Messi is not smiling. In the two matches and the few training sessions open to the media, there was hardly a moment when Messi smiled. Nor could he make the world happy with his game. Sinuous runs with the ball, every child’s dream, have not been seen even once in the 180 minutes he has been on the field here. Messi seems lost in the forest of markers in the crowded midfield, struggling to recreate his magical powers of dribbling or to conjure the spectacular out of the ordinary. News leaking out from the Argentina fortress is not joyful either. Staying behind the security and seclusion of their cocoon in Bronnitsy, Argentina will only appear in Saint Petersburg, the venue of their last group engagement against Nigeria, on Monday. He added that Messi played “as he had to play” and it is difficult for him to solve the problems of his teammates. However unlike Messi and Maradona may be, apart from using their left-foot, the world loves the contrast and comparison. Sampaoli has conceded after the 3-0 humiliation against Croatia that he is confounded by the implosion. “If I had set things up differently, things might have turned out much better,” he later said. Messi’s 31st will not be as happy as it he would have liked it to be. Still, let’s wish him a very happy birthday. Perhaps the new year will bring happier tidings.